Why are you piloting a program in Shenandoah County? Several years ago, youth service providers and business leaders approached our agency seeking to bring the proven, one-to-one mentoring model of Big Brothers Big Sisters to Shenandoah County. In the past year, community leaders and Shenandoah County Public School officials have revived their interest in providing this resource for children in their community. Big Brothers Big Sisters of America has recognized Big Brothers Big Sisters of Harrisonburg-Rockingham County as one of the top performing Big Brothers Big Sisters agencies across the nationwide network of nearly 300 affiliates. Our agency is in a strong position to provide the leadership necessary to pilot a program in our neighboring county. The pilot program will strengthen centralized resources to benefit youth across our entire service area. How is the pilot program being funded? We have worked with community leaders in Shenandoah County to set a fundraising threshold of $30,000 to begin the pilot. The funds would provide the staffing necessary to accommodate the expansion of services from the main Big Brothers Big Sisters office in Harrisonburg to a satellite location in Shenandoah County. When is the program set to begin? Once we have reached the $30,000 goal, we will move forward with the next phase of the program: recruiting volunteers and identifying children to match. Will the pilot negatively affect service to children in Harrisonburg and Rockingham County? No. Funds to support the Shenandoah County Pilot Program are primarily being raised within the Shenandoah County community. The funds will strengthen our overall program while allowing us to provide professionally-guided mentoring services to children who currently do not have this resource available to them. How can I support the pilot program? Businesses and individuals can partner with Big Brothers Big Sisters of Harrisonburg-Rockingham County to provide funds and/or volunteer mentors to make the pilot program successful. 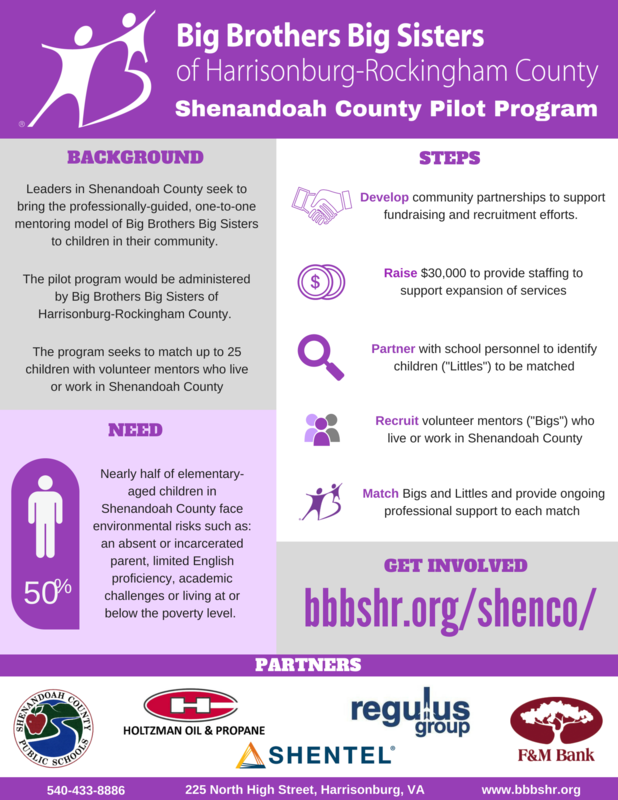 Contact Big Brothers Big Sisters of Harrisonburg-Rockingham County Executive Director Lindsey Douglas at 540.433.8886 or [email protected] to learn more about how you can support the Shenandoah County Pilot Program.